This is becoming a bath-product empties post – but if you haven’t heard me saying this enough, we love our hot baths! I take a hot bath pretty much every other night (and of course, I have a shower on the nights that I don’t take a hot bath). The weather is turning really cold now and all I want to do everyday is hide in my hot bath tub. We don’t have a bath tub in our own house, so now that we have a bath tub in our rented apartment in Belgium, we’re fully utilising it! Let’s look at what I’ve used up this month! A very basic sea salt that I’ve repurchased several times mainly because it’s cheap. It doesn’t have any scent but apparently dead sea salt helps soothe aching muscles. This is the 2nd last bottle of the set of 10 I purchased, and I’m so sad that it’s coming to an end! I don’t like mint scents so this was used by the hubby. He’s a huge fan now. Another bath salt that I’ve repurchased several times, also mainly because it’s cheap. It’s about 5 euros for a 1.3kg bottle, so I can’t really fault it much. I find these bath oils much less fragrant than the Aromatherapy Associates ones, and a lot less moisturising. It’s cheaper, but not by so much so I doubt that I will be repurchasing. To be honest, I didn’t get the chance to use this at all. The hubby used it all up – he’s just as addicted to hot baths as I am. He also mistook the ‘portion’ size – this calls for one cap per bath, whereas our usual cheap bath salts called for 5, so this was used up in a blink. Reviewed here, I really like this oil. It smells lovely, and makes my skin feel really nice and smooth. I will repurchase once I’ve gone through my stash of oils. 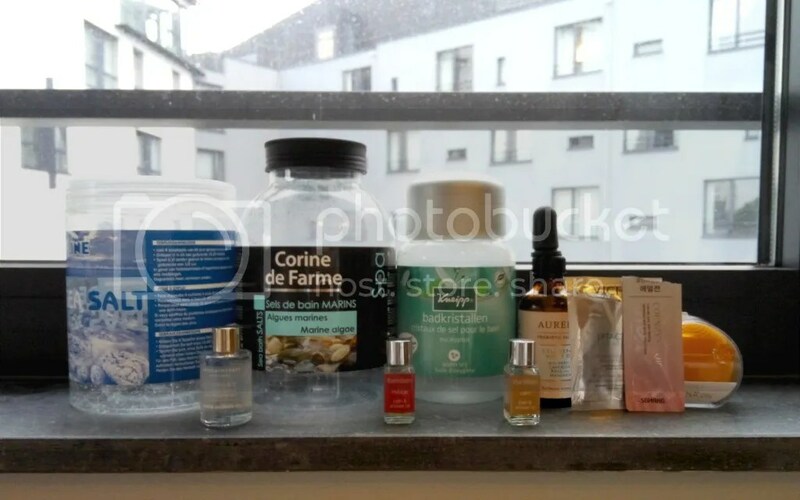 A couple of sachets of skincare products – I don’t really like receiving sachets of products, because I find that it’s never enough product to fully test if I like it. I very rarely purchase items after testing just 1 sachet – so what’s the point of even trying? Reviewed here, this was absolutely not worth the money and I will not repurchase. That’s it for this fortnight’s empties! I find it shocking that more than half are bath items – I like how empties posts forces me to take check of what I’ve been spending my money on; also by reviewing every product that I’ve used up, it tells me how much I’ve spent on products I’ve enjoyed and what I’ve wasted my money on. I hope my empties post have been useful for you as much as it’s been useful for myself!